That is what Desirée's mind screams at her. Running faster than she ever had before, faster than she thought she was capable of, she struggles to breathe as her side begins to hurt. At first, it's a dull ache, but gradually that develops into a sharp shooting pain. The only way she can describe it is it feels like tiny knives are being gouged into her side. Untamed branches pull her hair, thick shrubs and weeds grab at her dress, the faster she goes and the harder she struggles to avoid getting caught in the thickets, it does no good. They grab at her like bony fingers, holding her back, every second it takes away from her being able to run puts Hannibal a second closer to her. Rationally, she knows it's only a matter of time before Hannibal does catch up with her. He's faster, he can maneuver through the weeds and trees quicker, and he isn't panicked like her. And she was right to think that, at this moment he's only a few feet from her and she has yet to see him. 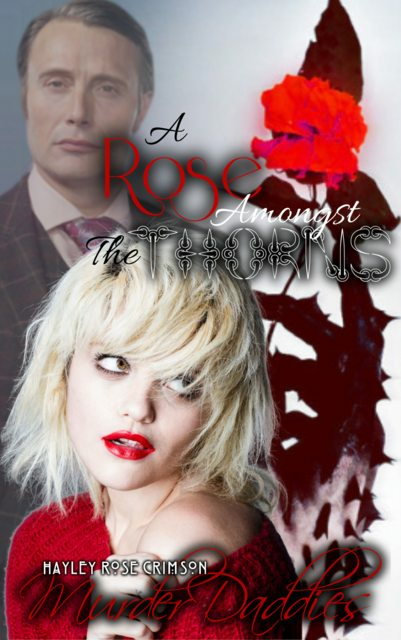 She slows down to ease the pain in her side, tears stream down her face, before she has a chance to regain herself she hears Hannibal a few steps behind d her, she bolts running straight into a thicket of thorns. Small lacerations lace her nimble fingers as she grabs at the thorny vines, struggling to escape their painful grasp. Just as she frees herself she feels Hannibal's hand graze her shoulder. She lets out a small cry before harshly swinging her body away from his touch, unfortunately, this makes her lose her balance. She lets out a screech before falling down, of course falling wasn't the end of her bad luck, she tumbles all the way down the small hillside. Pain courses through her body as she hits trees, underbrush, rocks, fallen branches, and God knows whatever else that lays on the wooded grounds. Once she comes to a stop the thought crosses her mind to try running again, but her body severely disagrees with that plan as she is unable to get up. The few tears that stain her cheeks are replaced with a steady stream of tears as everything sinks in. How could she have not seen it? How did she miss it? How did she not see Hannibal for who he truly is until now? How could he seem so perfect to her, when all along a monster lurked beneath that perfect facade just waiting to surface. Fear and heartbreak fill her all at once as her thoughts race. After making his way down the hill Hannibal stands over Desirée. She closes her eyes tightly, like a child who fears a monster is under their bed, but maybe, just maybe if they close their eyes tight enough that monster will cease to exist. Bending down Hannibal carefully scoops her up in his arms, bridal style. She opens her eyes, it's hard to see in the darkness, the half moon hardly cut through the canopy of trees, but she looks into his eyes. Hannibal returns her gaze for a brief moment before trudging forward with her through the brush. "If you were going to run, you could have run closer to the house," he points out, the comment is a bit snarky but his tone remains indifferent. Worried she would fall, she had put her arms around his neck, it was instinct more than anything. But this still put her into a difficult position. Confusion overruns her mind, she still feels something for him, not even what she had seen was able to rip her love for him from her heart, but she also hates everything he had done at the same time. She's still unsure of what he's going to do with her, whether he was going to kill her or not. "Are you going to kill me, Hannibal?" She chokes on the words as they leave her mouth, a clammy feeling taking her over. Hannibal gazes down at Desirée's frightened features and the tears rolling down her cheeks. He doesn't have plans to kill her, he has something much different planned for her. "No," Hannibal replies in that emotionless paced tone of his. Well, this is a proverbial wrench in the works for Hannibal, he hadn't intended for her to find out all of this just yet. Still, he knows what he's going to do from here, it's just a bit different from his original plans. Hannibal's home comes into view before too terribly long, although it felt like an eternity in the Devil's arms for Desirée. "What are you going to do with me?" She has to take a breath between every word in order not to start heaving from her crying. The words echo through Hannibal's mind, his dark, cold gaze meets her tear-filled eyes, sending shivers down her spine and numbness through her body. Her heart's at a full gallop and terror courses through her veins as she waits for a reply. A/N: A bit on the short side and I did just kinda throw you into a scene which is probably a little confusing, but this is from a further point in the story. Kinda like how at the beginning of season 2 it shows the scene of Jack and Hannibal fighting.